Oakridge BBQ has gained quite a reputation amongst BBQ competitors and backyard warriors all over the country. 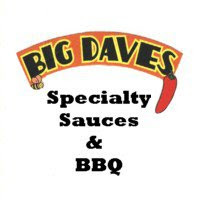 Their all natural wild game and BBQ rubs are among the very best available. Formulated for everything from venison to pork and chicken, Oakridge uses only top shelf ingredients for each of its blends. 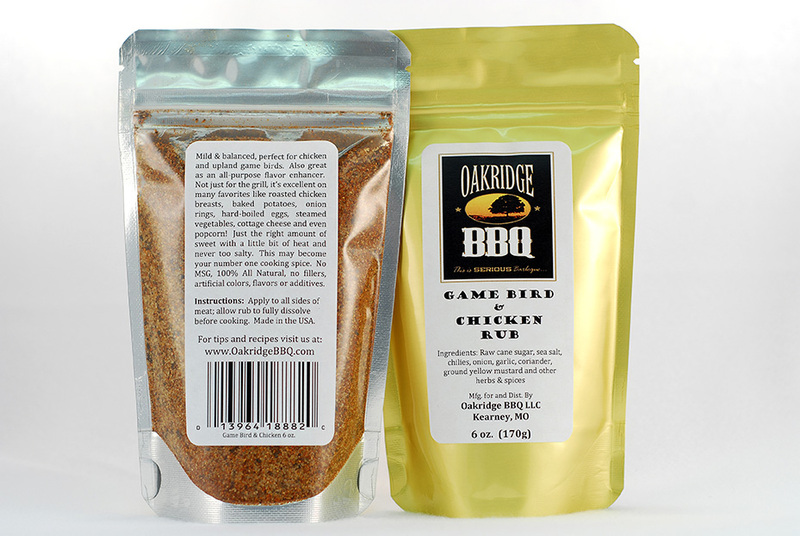 Game Bird and Chicken Rub is the second Oakridge BBQ blend I've had the opportunity to use. The first, Secret Weapon Pork and Chicken Rub, received a five star rating and ranks among my absolute favorite BBQ rubs. While Secret Weapon has recently been my "go to" rub for chicken and pork, I am quickly running out. I therefore turned to Game Bird when I smoked chicken legs this weekend. Game Bird and Chicken Rub is a sweet, relatively mild rub that starts with raw cane sugar and sea salt. The ingredients aren't all that different from the Secret Weapon rub. It doesn't have quite the same earthy chili contrast as Secret Weapon, but the flavors are somewhat similar. Game Bird is the type of versatile blend that qualifies as "all purpose". The "not too sweet" rub compliments vegetables and fried potatoes equally as well as poultry. The savory spices are aromatic and pleasant for nearly any application. There is even a slight note of heat from ground chilies. I've used Game Bird on grilled and smoked poultry. The rub was perfectly seasoned for smoked chicken. The sweet and salty flavors were enhanced by the hardwood smoke. On the grill, the sugars caramelized forming a flavorful bark. The key to Game Bird (as with any good rub) is the perfectly formulated salt content. The rub is never lacking in flavor, but never overwhelms the meat with saltiness. 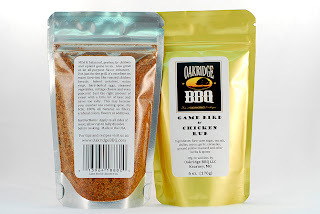 It would be hard for any product to top Oakridge BBQ's Secret Weapon Pork & Chicken Rub, but Game Bird certainly holds it's own in comparison. The sweet, mild rub is a fantastic option poultry and a variety of other dishes. To order your own, check out the Oakridge BBQ website. See how Game Bird rates on our "Product Reviews" page. 2 Response to "Oakridge BBQ Game Bird & Chicken Rub"
These are excellent Derek! I had to get a lb of game bird and lb of competition. I should be good all summer. Del - They're some of the best rubs available. I really love their products.